In just about every game, especially every “big” game, and every game of consequence, there is a player that turns into a hero in an instant. This player turned hero does not plan on it, but he or she ends up doing the unthinkable: they make the play of the game. The coach may not even know their full name, the other players don’t associate with them that much if at all, and most fans don’t even know they’re on the team. But this hero in hiding is about to go public. This hero may not be a starter or a star, but this average Joe will make a play, a game saving tackle, a field goal in overtime, a pick-six interception/touchdown return, that wins the game or seals the victory. David was a “sung” hero. He defeated the giant Goliath with a sling shot and a stone. In so doing he defeated the archrival Philistine army and won the victory for Israel. The eighth son of Jesse went on to be the sweet psalmist of Israel, their greatest King, and the apple of God’s eye. After David’s unlikely but stirring victory, the women sang, “Saul has slain his thousands, but David his ten thousands” (1 Samuel 18:7). While there are many others like David, there are many more unsung heroes whose songs have yet to be sung. The woman at the well was an unsung hero. The Samaritan woman from the town of Sychar was the first New Testament evangelist. “But” she was a woman, and a Samaritan woman at that. When the disciples returned from buying food in town, they were surprised to find Jesus talking with “a woman”. Jesus came restore and redeem. But before He came the status of women was at best the least of all. And it was a common fact that the Jews had no dealings with Samaritans. Worst still, this women had a checkered past. She had been married five times, she was living with a man that was not her husband, and she went to the well alone in the heat of the day. No friends, no lasting companionship, no true loving relationships. Yet she is the first one to whom Christ revealed himself to outside of his inner circle. Heaven arranged for her to meet the True Prophet, the prophesied One, and the Savior of the World. Coach Bill Courtney is also an unsung hero. He helped form a group of young men into an academic and athletic team. 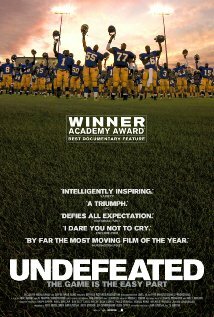 Coach Courtney is portrayed in Undefeated, an outstanding documentary directed by Daniel Lindsay and T.J. Martin. The film documents the struggles of a high school football team, the Manassas Tigers of Memphis, Tennessee, as they attempt a winning season after years of losses. Coach Courtney volunteers his time, and pours his heart and soul into the players as they are transformed before our eyes from a down-and-out, rag-tag team to a solid, winning championship caliber team. The film is a “must see” and won the Academy Award for Best Documentary Feature of 2011. God has a way of choosing and using unlikely, unassuming underdogs to achieve his purposes. This teaches us that God is not looking for superstars, standouts phenoms, or number one draft picks who are full of themselves. God is looking for those like Coach Courtney who are selfless and tireless in their passion for victory. God is looking for those like the woman who met Jesus at the well, an unlikely unsung heroine whose name we don’t even know. God is looking for those who like the woman of Samaria are thirsty for the living water. God is looking for those who don’t mind leaving their water pots, for those who will run and tell the very people who may despise them and may disdain them that they have found the Christ. She was the lone witness that caused many of the Samaritans to believe that Jesus was the Christ, the Savior of the World. And God is still looking for heroes whose songs have yet to be sung. < Previous Are You Kidding Me?